 White Island volcano Volcanic Ash Advisory: VERY MINOR STEAM ERUPTIONS ONGOING, LAST OBS VIA WEBCAM 140530Z. White Island in the Bay of Plenty ca. 50 km off the North Island's east coast is one of New Zealands most active volcanoes, well known for its spectacular crater with strong hydrothermal activity and sulphur deposits. It is part of the active Taupo volcanic zone and last erupted in 2001 (phreatic explosion). Uninhabited 2 x 2.4 km White Island, one of New Zealand's most active volcanoes, is the emergent summit of a 16 x 18 km submarine volcano in the Bay of Plenty about 50 km offshore of North Island. The 321-m-high island consists of two overlapping andesitic-to-dacitic stratovolcanoes; the summit crater appears to be breached to the SE because the shoreline corresponds to the level of several notches in the SE crater wall. Volckner Rocks, four sea stacks that are remnants of a lava dome, lie 5 km NNE of White Island. Intermittent moderate phreatomagmatic and strombolian eruptions have occurred at White Island throughout the short historical period beginning in 1826, but its activity also forms a prominent part of Maori legends. Formation of many new vents during the 19th and 20th centuries has produced rapid changes in crater floor topography. Collapse of the crater wall in 1914 produced a debris avalanche that buried buildings and workers at a sulfur-mining project.